Description: This worksheet is great for practicing the Present Simple tense. There are lots of different activities, including reading, writing and plenty of speaking. There’s also lots of useful vocabulary and collocations for your students to learn. It’s ideal for building your students’ confidence and fluency. This worksheet looks at some common expressions used when reading and talking about crime. There are four different crime stories in a newspaper format, with a gap-fill exercise. 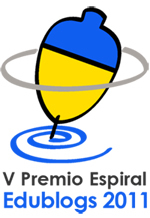 There are extended exercises, recycling the vocabulary and collocations. There are also discussion questions about crime. The lesson rounds off with a crossword, which can also be set as homework. Description: Movies make a great discussion topic. However, many lower-level students lack the language skills to talk about it effectively. This two-page worksheet teaches some useful phrases and has info-gap exercises and speaking practice. Recommended for elementary and pre-intermediate level students. Description: This business-English worksheet looks at making appointments over the telephone. There is lots of practice of the Present Continuous for future plans, and your students will have the chance to brush up on their telephone English. There is a conversation, information-gap activity, role-plays and discussion. The worksheet is designed for elementary to pre-intermediate level students. 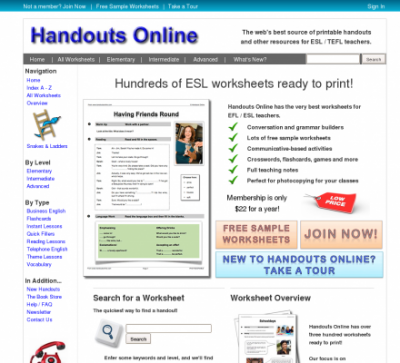 Description: Handouts Online has lots of situation-based worksheets. They teach the language your students will need in order to get by on a daily basis. Can your students order a a double-latte with ease? Find out with this worksheet! There’s a conversation, role-play practice and lots of easy discussion questions to keep your students busy. It’s a great way of increasing your lower-level students’ confidence with English. If your students need practice of past simple irregular verbs, this could be just the ticket. This crossword is suitable for lower level students, and can be used either in the lesson, or as homework. ’Looking into the Future’ is a great way of building your students’ abilities with more complex future tenses. This worksheet has extensive practice of both the future perfect, and the future perfect continuous (progressive). There’s a conversation, grammar-based exercises and lots of speaking at the end. There’s a choice of having a discussion, or (if you have lots of students) a ’find someone who’ exercise. This worksheet is designed for intermediate classes, but can easily be adjusted for other levels. 01/08/2012 00:57 Isabel Cota Muñiz Enlace permanente. INGLÉS No hay comentarios. Comentar.